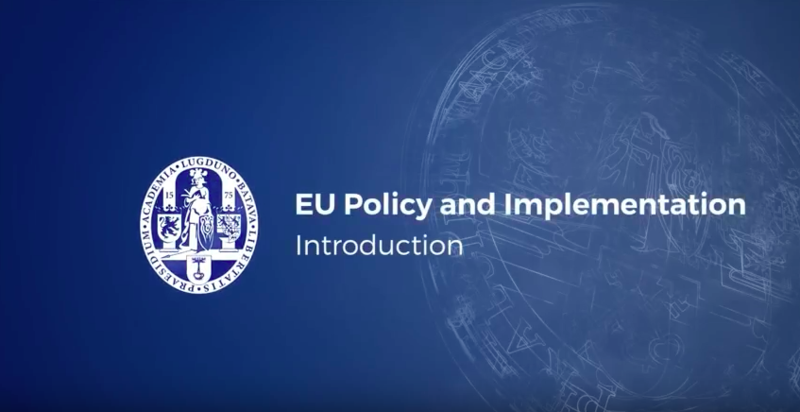 In this course, we learn how EU policy is made, and how policy is transferred to member states and implemented by various authorities, including regional and local governments. We discuss the challenges of the European multi-level governance structure. We also focus on the main causes of policy failure or success. On this journey, we focus on actual policy and present the views of various experts: how easy is it to establish yourself in another EU-country? How do governments make sure that the air you breathe is clean? And who is responsible? You will be able to do research together in your own local setting. Research on implementation in which you can make comparisons between different countries or areas. If you live outside the EU, this is not a problem. We have developed assignments in such a way that you can do research in your area and compare your findings with others. So, are you curious? Please join: 'EU policy and implementation: making Europe work'. Whether you live in the EU and are interested in how European policy affects your daily life or you are already an expert in the field looking to update your skills, or want to understand how European Union policy is made and implemented, this course will offer you the theory and practice you need. In keeping with the nature of the material and the purpose of the course, this course is free, and will remain free for participants. If you are interested in receiving a formal certificate, there will be a fee to cover costs. EU policy and implementation: making Europe work! is an online course offered by the Faculty of Governance and Global Affairs at Universiteit Leiden in the Netherlands. Taught in English, the course is intended for any individual who is interested in learning more about how European policy affects daily life and is especially ideal for individuals working in public policy. The course covers how European policy is created; reviews decision-making, transposition and implementation and discusses how policy may be improved in the future. To successfully complete EU policy and implementation: making Europe work!, students will need to spend 2 to 3 hours per week studying. The course lasts for 5 weeks and features videos and reading assignments every week. Students are also responsible for completing a series of short writing and research assignments related to the course material. Those who compose all of the assignments and earn passing grades will pass the course. The class is offered free or charge, but a small fee is assessed for an optional Verified Certificate of Completion. Coursera provides financial aid to learners who would like to complete a course but cannot afford the course fee.